“If you had of asked me when I first started doing triathlon that I would have a couple of World Championships, an Olympic silver medal, I’d have the most medals by an Australian in World Championship events, I would have said ‘no way’,” Jones said. Before that influential suggestion, Jones had been identified as a talented race-walker. But as told to Multisport Dreaming, she had grown on a farm where she had swam, rode horses and enjoyed running, she was a multisport athlete at heart. Starting University in Wollongong, Jones started to ride to the Cronulla Triathlon Club to train on weekends, around 65km. From 1990 she was making a living from triathlon. While Jones’ early nineties were impressive, her feats when she returned to the scene in 1997 were even more so. In her first ITU World Cup race back she beat fellow Australian Emma Carney, something no other woman had done for two years. 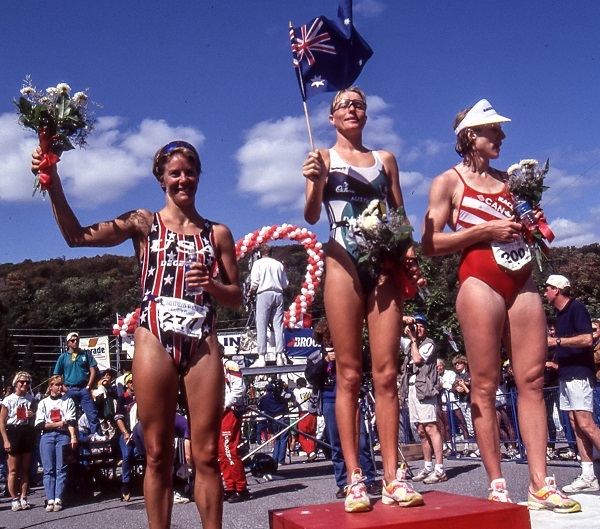 One of Jones personal highlights came in that same year at the 1997 ITU World Championships, when she sustained deep cuts in her feet after clashing with another athlete’s bike in transition, but ran on to a bronze medal regardless. “In Perth I got third and the three Australians who got first, second and third. I ended up having to get three stitches in one foot and four in the other. When I crossed the finish line I thought, I’ve got nothing left and then looked down at my feet and thought ‘oh my god’,” Jones said. 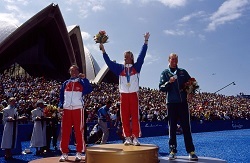 Three years later Jones’ silver medal in Sydney was the first for Australian in the Olympic triathlon event. Outside of her ITU career, Jones became one of the most consistent athletes ever, with a win tally that is reported to be over 175 across Olympic, off-road and long-distance events.